Some scientists include peak-ring craters with multi-ring impact basins. 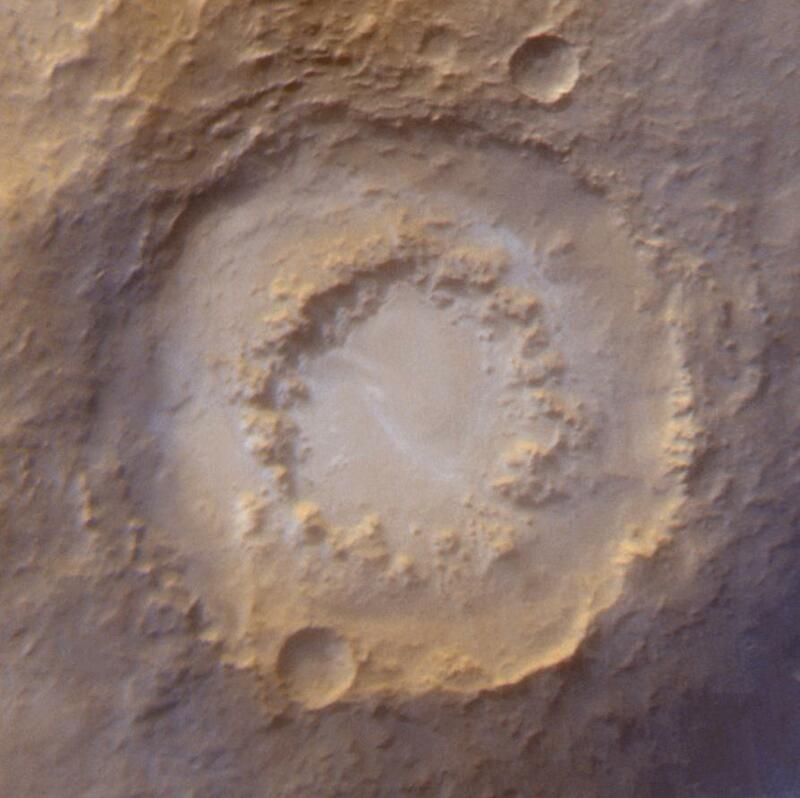 In any case, when complex craters reach diameters of 100 to 150 kilometers (60 to 90 miles), the uplift in the center and the slumping on the walls combine to make a ring of peaks in the crater's center. Examples of peak-ring craters include Lowell (202 km/126 mi wide), Lyot (222 km/ 138 mi), Galle (224 km/139 mi), Kepler (228 km/142 mi), and Huygens (467 km/290 mi. Because peak-ring craters are all considered old, the ring of central peaks is usually eroded and sometimes not a complete ring. As it happens, Gale Crater, where Curiosity is currently exploring, is large enough — 150 kilometers (90 miles) wide — to have a peak-ring in its center. However, Gale's giant stack of sediments has buried any central peak or ring. Or has it? Some scientists have identified parts of the mound that they say could be central peak rocks sticking up through the sediments. Perhaps further study from orbit, plus exploration on the ground by Curiosity, may identify rocks or outcrops that could have come from a central peak. Stay tuned.